Our dear friend and Executive Producer of THE ANSWER, Matt Moran, graduated to Heaven on February 8, 2019. This physically fit, active, 49-year-old man, died unexpectedly of a heart attack. In lieu of flowers, Matt’s wife, Veronica, has asked donations be given to THE ANSWER. Matt was dedicated to the Lord completely and supremely. His daily life demonstrated the commitment of a true disciple of Christ. As the Executive Producer, he generously gave his time, talent and treasure to see THE ANSWER come to fruition. Matt was passionate about this original musical play. He said THE ANSWER was his most important project. He even taught himself to be a videographer to edit the video footage which can be seen on this website. Matt will be missed profoundly, but we take comfort knowing he was appointed by God and his fruit will remain as promised in the following scripture. 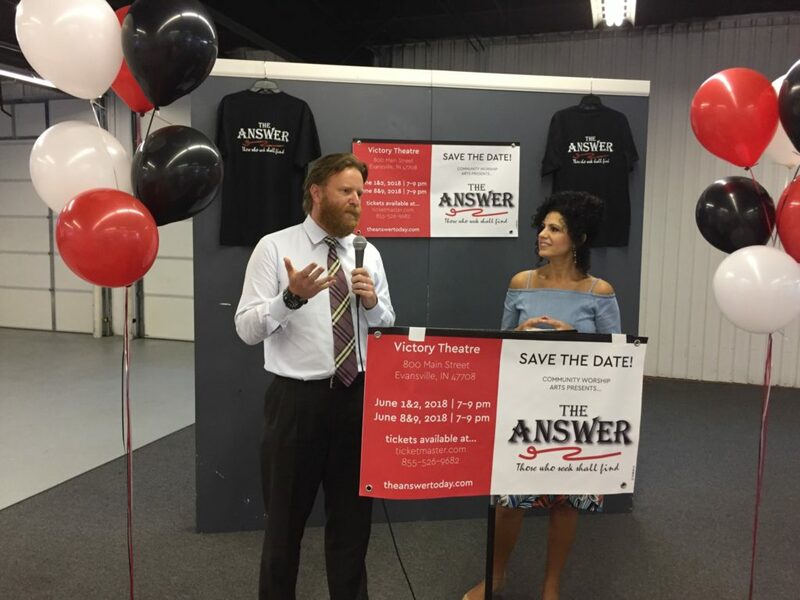 THE ANSWER is original 2-act musical play that premiered in June 2018 at the beautiful Victory Theater in Evansville, Indiana. While most initially identified with the theme of restoring family and faith, the script came alive as it was based on real-life stories. The music transports you to a place where your heart is renewed, your faith is restored and tender romance still exists. The songs will touch the heart even beyond the spoken words. Have you ever been unjustly accused with no way to defend yourself? That is a gut-wrenching experience…but then God is there. THE ANSWER comes in a way that wasn’t quite expected. This play will give you hope and renew your faith. You’ll see all ages from young kids to a grandma…let’s just say you’ll see everyone and a dog! The music was produced in Nashville – The actors and singers are of the same caliber. Please consider making a donation to this event and click on the donate button to be connected with our Pay Pal account. Community Worship Arts Inc. is a tax-exempt 501 (C) 3 organization. Pre-show interview with THE ANSWER creators Jim and Cheryl Peterson, Music Producer Geron Davis, and Executive Producer Matt Moran. Want to be a part of The Answer? 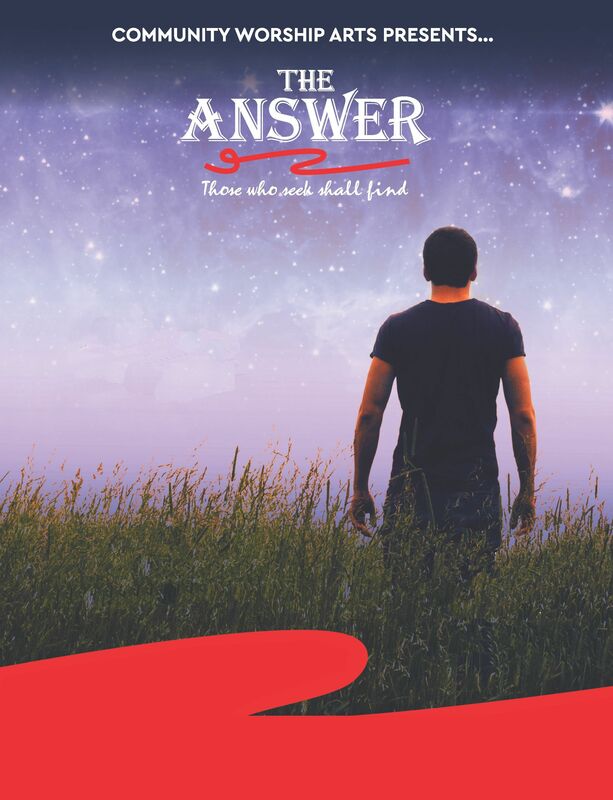 Tickets for The Answer will be available soon. Consider a tax-deductible donation to Community Worship Arts to keep more fine entertainment like this coming! Contact Jim Peterson if you’d like to bring THE ANSWER to your town!